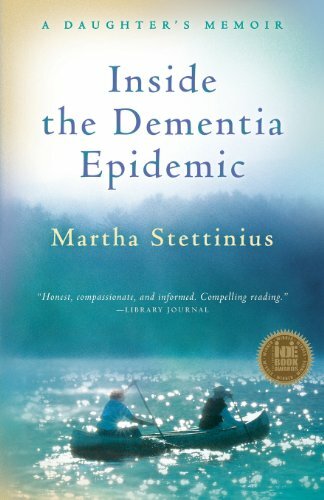 Martha Stettinius writes a page-turner as good as any novel I’ve ever read with “Inside the Dementia Epidemic — A daughter’s Memoir.” But wait–this isn’t a novel. This is a true story that just happens to be one of the best ‘Guides’ I’ve seen when it comes to caring for a loved one with Dementia. Martha writes about Dementia, but more than that she writes about her mother, Judy. She tells about her mother’s loving smile and a strained relationship from the past. The estrangement that is not uncommon between mother and daughter when personalities and youth collide. Happy childhood or not–Martha steps up to care for her mother through all the twists and turns of Dementia and memory loss; the maze of home care, assisted living and finally the dreaded nursing home. Through the process of caring Martha learns to know her mother and herself more than she’d ever have done without the traumatic journey into care-giving. She allows feelings to surface and be shared with honesty for the reader. With courage Martha speaks of anger and resentment that all of us have felt while giving care to someone to the point of exhaustion. Exhaustion wrought as much from sadness as fatigue. Doubts and concerns haunt Martha as she searches for answers for Judy’s care. Yet as I read, I’m awed by her persistence and investigative skills in pursuit of the very best for her mother, her beloved mother. I think her choices were outstanding and perfect. When I walked this road with my own mother, I often found myself near paralyzed with fear; afraid to make any decision for making the wrong decision. No such fear gripped Martha. She was a researcher she knew what she needed for the love of her Mom and she searched until she found it. Martha explains in detail the major health fears and facts as we follow her years of care-giving for Judy; Urinary infections, Incontinence, Sexual Behavior, Anger, Fears and much more. Besides the ups and downs of care-giving, this book is a guide to making optimum choices for your loved one as you traverse the long road into Dementia. As much information as any mini-encyclopedia about: Home-Care, Assisted Living, Nursing Homes, Alzheimer’s lock-down units, Financial Blunders and Burdens. Martha supplements this mother-daughter love story with facts and appendices reflecting the cutting edge of dementia research. When her mother eats only sweets, she explores the connection: is Alzheimer’s “Type III Diabetes”? She refuses to surrender to hopelessness. She shares the ultimate guide to How to Save Yourself: an anti-dementia, anti-diabetic diet; and the newest medical tests. As Martha has learned to sit in silence and hold her mother’s hand, she has also learned to speak up, research, and reach out to give us all new ways to win the war. M artha Stettinius was a “sandwich generation” mom and the main caregiver for her mother, Judy, who had vascular dementia and Alzheimer’s disease. Martha serves as an expert in dementia for eCareDiary.com, and as a volunteer representative for New York State for the Caregiver Action Network (formerly the National Family Caregivers Association), a Washington, D.C.-based advocacy group. She has a website at: “Inside The Dementia Epidemic” a Daughter’s Memoir. She works as an editor, and earned a master’s in English Education from Teachers College, Columbia University. Hello sandy 🙂 again yes I do have sisters living close by, but they just don’t want to get involved. They take moms every word personal. I try to explain but they don’t get it. I’m reading about shadowing. I feel lucky mom can walk with out my assistance but every mornig I wake up, she’s just watching me. She will call my name if she doesn’t see me. I feel so badly for her. Thank you. Norma, I’m glad you have family who lives nearby. Though they may not understand now, at your Mom’s current stage, perhaps they will be able to give you breaks from caregiving as time passes. I, too, had issues with “shadowing” and my Mom. It’s sort of unnerving to have them so dependent. But when you consider how limited their memory is, you are probably the center of her world. Norma, I don’t know if you’re on Facebook, but they have some wonderful support groups. Memory People and Forget Me Not are two of the groups that I frequent often. It is so helpful to spend time with others who share the same issues. It’s comforting to know that so many understand. If you’re on Facebook, I hope you’re able to visit a few of these groups. My own Facebook Page for Alzheimer’s Support can be found there also. Hello sandy thank you very much for answering, you don’t know how important it is for me to have as much information as I can, thank you I’ll stay in contact please feel free to email if possible God bless you. Hi my name is norma mom has dementia, this is a horrible thing, but I’m a bit confused. I don’t know what stage she is, but she is very angry, abusive she sees many evil things, very confused depressed. At times incontinent. What I’m confused is because her doctor told me she has short memory loss, but some times, very seldom actually, she remembers things that happen two days before. I don’t know what to think, she was telling me that a bottle of hair spray was her mom. I change the subject and she forgot the next day, but the following night she asks again for the can, please tell me what you think. Norma, it is very difficult to be caregiver for a loved one and I feel so badly for you. Do you have other relatives that might help, someone to offer time-outs where you can rest from all the caregiving? It is especially stressful to be the caregiver for someone with dementia. Yes, it is short-term memory loss. Sometimes they can’t remember a minute later, but they might remember something from yesterday. You are so correct to feel confused. It is a confusing disease. I’m glad to hear that you are reading a lot about dementia. As you learn more about the disease it will help a lot. It would also help if there were a local group or meetings about Alzheimer’s that you could visit or join. You might ask your mother’s physician about other groups or support for those who have family members such as your Mom. The Alzheimer’s Association in the US has a toll free phone number 1.800.272.3900. They offer literature, meeting places and some free support for caregivers. If you’re in a different country, they should have a phone number as well. It’s difficult to judge the stage she might be in as they never stay in only one stage at a time. And no two people have the exact same symptoms so the exact stage is not very important. Usually, the person with dementia moves through different stages of the disease constantly. They might be Stage 3 at one moment and stage 4 at another. Their thoughts and behavior can fluctuate from moment to meoment. Understand that they have no control and don’t understand, themselves, what is happening. Just love her as you always have and keep her from harm. I’m sure she loves you as well. Right now, she is just very confused by what is happening to her. Our thoughts are with you and I hope you’re able to find a local family member or someone to help with her care and share feelings with you. Let us know how you are doing. Wow, loved alot of what I saw on your tweets. This might sound really odd, but I’m really envious of you. I wish I could see my Mum but I have been shunned. She has Alzheimers now and they won’t even let me say goodbye, she is 77…. I just don’t know what to say, but I’m envious of you today. That is very sad that you aren’t allowed to see your mother. I hope something changes so you can spend time with her. She might well enjoy spending time with you and have a sense of who you are. My mother would call me “daughter,” yet she no longer knew what the word “daughter” meant. Still, she knew I was important some-how and we always had great visits like old friends. I certainly hope something changes for you, it would certainly benefit both you.